Variation in discharge on seasonal and annual timescales has a strong influence over whether nutrients are stored or exported. Based on estimates of inputs, outputs, and storage of P in Bear Brook, New Hampshire, Meyer and Likens (1979) estimated that 48% of annual inputs and 67% of exports occurred during 10 days of the water year. In contrast, phosphorous accumulated for 319 days of the year of study, and this storage presumably increased the opportunity for instream processing. Nutrients accumulate during low flows because they occur mainly in association with fine particulates, whose transport is dependent upon discharge, and in biofilms, whose biomass accumulates during periods of low flow. Uptake length, the distance traveled by a nutrient atom before immobilization, increases with discharge and water velocity, as was documented in a cross-biome comparison of ammonium SW in 11 North American rivers (Figure 11.7) (Peterson et al. 2001, Webster et al. 2003). The uptake length for ammonium and particulate N also increased with stream size within the Kuparuk River watershed of Alaska in response to increases in water velocity and depth (Wollheim et al. 2001). Similar results were obtained in two New Zealand streams, where temporal variation in uptake lengths of ammonium, nitrate, and phosphate was largely explained by changes in water velocity and depth (Simon et al. 2005). An increase in uptake length at higher discharge likely is the consequence of the reduced opportunity for solutes in stream-water to interact with sediment surfaces and biofilms (Peterson et al. 2001). Because of the strong dependence of SW on stream velocity and depth, uptake velocity vf is increasingly preferred in order to standardize for these variables. storage has the potential to increase nutrient processing by slowing the rate of downstream transport and increasing the exposure of dissolved nutrients to locations of high nutrient uptake. This effect is likely to be greatest when storage is the result of surface-subsurface exchange (Figure 11.8) because water entering sediments will come in close contact with biofilms, whereas storage in pools and back eddies is less likely to have this effect (Hall et al. 2002). Hampshire sites. Values of AS/A greater than 1 have been recorded in streams with highly permeable bed material (Valett et al. 1996, Marti et al. 1997, Butturini and Sabater 1999). In an Antarctic stream fed by glacial meltwater, AS/A exceeded 1 in all stream reaches due to high gradient and porous alluvial materials (Runkel et al. 1998). 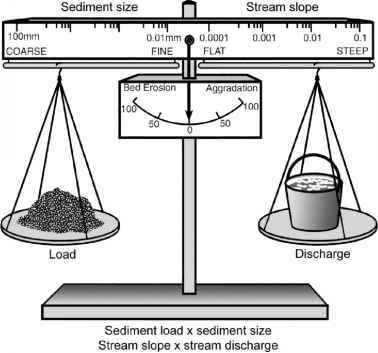 Transient storage within the stream channel is highly influenced by obstructions such as boulders and wood. When vegetation and wood were removed from a vegetated agricultural stream and a forested blackwater stream, transient storage area decreased by 61% and 43%, respectively (Ensign and Doyle 2005). When flow baffles were then added to create in-channel transient storage, AS increased more than threefold in the agricultural stream and more than doubled in the blackwater stream. Although transient storage is expected to increase uptake rates due to longer exposure of dissolved nutrients to sediments and biofilms, results are equivocal. Phosphorus uptake measured with the stable isotope of P (33P) in two forested streams was greater in the stream that had deeper sediments and so presumably also had a larger transient storage zone (Mulholland et al. 1997). Uptake velocities for ammonium and phosphate increased markedly following the addition of flow baffles to the blackwater stream studied by Ensign and Doyle (2005). Valett et al. (1996) found a positive relationship between transient storage and uptake in a stream in New Mexico with a large storage zone, but both were also correlated with discharge, and so the causal relationship is unclear. In Sycamore Creek, Marti et al. (1997) saw no relationship between nutrient uptake length and size of the transient storage zone, even though the latter varied greatly following a flood disturbance. In a comparison of 13 forested headwater streams in New Hampshire, transient storage explained only 35% of between-stream variation in ammonium vf during summer months and 14% on an annual basis, possibly because storage occurred primarily in pools owing to the shallow hyporheic zone of these bedrock streams (Hall et al. 2002). Similarly, an interbiome study comparing ten undisturbed streams reported a low correlation between ammonium uptake and transient storage (Webster et al. 2003). In three New Zealand streams, SRP and nitrate uptake were uncorrelated with transient storage, and here again surface pools accounted for a large proportion of transient storage (Niyogi et al. 2004). In some circumstances, including when the hyporheic zone is minimal and surface algae and biofilms are productive, transient storage associated with the bed surface may be of primary importance. By adding NaCl as a conservative tracer, Mulholland et al. (1994) showed that transient storage was greater in experimental streams with high biomass of filamentous diatoms and blue-green algae compared with streams that contained low algae biomass. In a meltwater stream in the McMurdo Dry Valleys, Antarctica, nitrate removal in the hyporheic zone accounted for 7-16% of the total loss, and the majority was believed to be taken up by algal mats on the stream surface. Hyporheic transient storage was a small fraction of stream channel area in a Mediterranean stream and so did not play an important role in nutrient uptake, which likely occurred in surface sediments (Butturini and Sabater 1999). In a study conducted in 12 tropical streams in Brazil, reaches with greater AS/A and longer water residence times such as pools and marshes showed higher ammonium uptake rates than did runs and meanders (Gucker and Boechat 2004). Because transient storage occurred mostly in surface waters and accounted for 52-85% of ammonium uptake, surface transient storage zones were important locations of ammonium retention.